Raise the roof with a gingerbread house-making party. 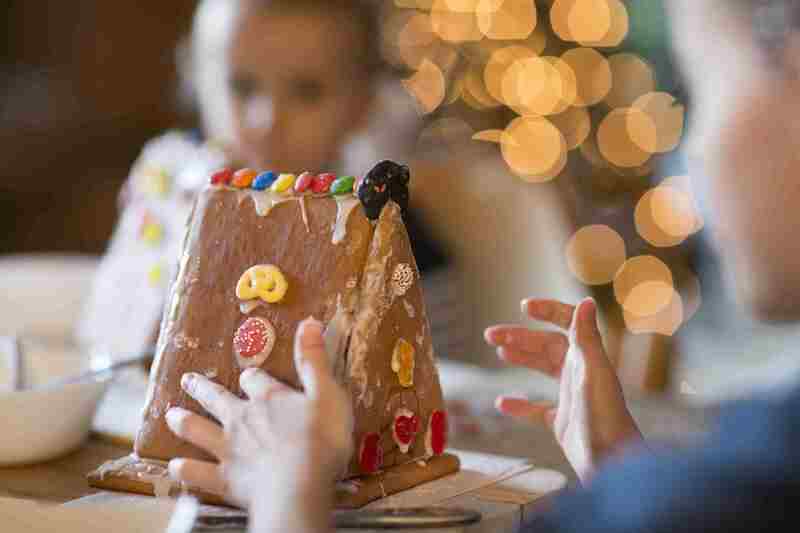 For young children, you can pre-build small houses out of gingerbread or graham crackers. The best “glue” to hold the walls together is royal icing. Set out an array of candies and give each child a plastic sandwich bag filled with icing that's tied off with a small hole poked in one corner. Show them some basic ideas for decorating the houses, like using shredded coconut as snow, and then let them create their masterpieces. For favors, you can provide kid-sized aprons or gingerbread-man cookies in cellophane bags. If you have teenagers and want to kick the theme up a notch, have the teens design and bake their house parts ahead of time and bring them to the party. Then, give everyone an hour to assemble and decorate their houses. Put everyone's creativity to the test by inviting some judges over to choose the best gingerbread house. Cookie making is a fun Christmas tradition, but it can be a challenge to make more than two or three kinds of cookies. 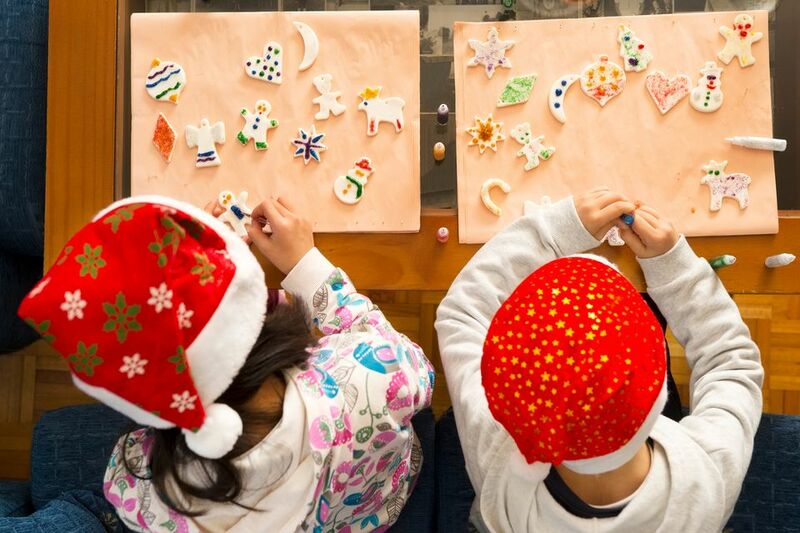 Luckily, you can host a fun cookie exchange for kids to make at the party. Simply ask guests to bring two dozen of the same type of cookie to the party, plus enough copies of the recipe for each attendee. Display the cookies on a table with the recipe cards and the child’s name next to each tray. Then, each child can load up an empty plate with two of each type of cookie. While making their way around the table, the children should pick up a copy of each recipe. Set up a station where the kids can then decorate covers and bind the recipes into small cookbooks as a memento of the party. It wasn’t all that long ago that Christmas gifts were made rather than purchased. Bring back the tradition by hosting a Christmas craft party. You can do this in a simple way by having the Christmas party focus on ornaments only and setting up three or so stations where the children can make different decorations for the tree. You could also have kids undertake other crafty holiday projects like making advent calendars. Instead of making actual gifts, guests also could make wrapping paper or Christmas cards at the party. The crafts should be enough of a favor themselves, but you could also send creative kids home with a blank artist’s notebook and a set of Crayons or drawing pencils. It’s natural for kids to associate Christmas with receiving presents, but you can help them find the deeper meaning by reaching out to those who are less fortunate. Throw a party with a purpose by focusing on a charitable theme or simply asking guests to bring nonperishable food, winter coats, or other donations to the Christmas bash. You could decorate the main table with a large stack of canned goods shaped like a tree, trim a tree with scarves as garland, or hang strings of mittens above every doorway. At the end of the celebration, you can talk about what you're grateful for this holiday season and donate the goods to the charity of choice. A night of Christmas caroling can be cold, but it certainly warms the heart. As guests arrive, hand out songbooks you’ve made or purchased with copies of some of the most common and favorite carols. Gather everyone around the piano or stereo to practice the songs. For parties involving young children, it's recommended to stick to two or three short songs they can easily memorize. Go over some safety guidelines before heading out, like walking with a buddy and staying on the sidewalk. Bundle up, hand everyone a candlestick, and spread holiday cheer by singing door to door. Have kids take turns presenting neighbors with a plate of cookies or a kind greeting before moving onto the next house. A few people can stay back at the house to make sure hot cider, hot cocoa, and other warm treats await the carolers upon their return. Break away from tradition with a Rock ‘n’ Roll kids' Christmas party. Spray everyone's hair with temporary red and green dye when they arrive (after receiving parental permission, of course) and brand everyone with easy press-on Christmas tattoos. Push aside couches, hang up a disco ball, and let kids dance to holiday songs covered by pop bands. To step it up a notch, you can even rent a karaoke machine. When it comes to food, make mini pizzas in holiday shapes. To do this, simply cut the dough with cookie cutters before adding the toppings. For favors, send everyone home with a music-themed tree ornament, such as an electric guitar or drum set. Whether it’s the book by Chris Van Allsburg or the movie starring Tom Hanks, The Polar Express is a Christmas story loved by many kids. To make this party unique, invite kids to come to your house dressed in pajamas on invitations made to look like train tickets. You can also serve hot chocolate, as noted in a particular scene from the story, and a train-shaped cake. At the party, you can take turns reading the book together or simply watch the movie. As the party ends, send everyone home with a jingle bell, which is a reference to how the boy in The Polar Express finally believes Santa Claus is real. Although decorating the Christmas tree is typically done in the living room, it can be fun for kids to have a tree in their bedroom as well. You can sometimes find inexpensive, small, and/or artificial trees at craft or discount stores. As you come across them, buy several tiny trees and invite kids over for a tree-decorating party. If you plan a year ahead, you can score excellent deals on ornaments, ribbons, and garland right after Christmas. You could also have kids bring or make their own decorations. For dessert, serve a delicious tree-shaped cake. Give your kids’ Christmas party an international theme by hosting a Christmas around-the-world party. Ask everyone to bring a side dish that represents the culture assigned to them, and feel free to sing songs that tie to the countries, such as Stille Nacht (Silent Night) in German. Alternatively, you can play this music on speakers. Another fun activity would be to teach kids how to say “Merry Christmas” in different languages.